It’s summer, and it’s a great time to be outside. What better time is there to get out and ride a bicycle? More and more communities offer trails for cycling in their parks, or bike lanes on the roadways to encourage people to cycle for enjoyment, exercise, environmentally-conscious commuting – or all of the above. But like most things, it’s smart to consider safety before you hop on your bicycle and head for the road. 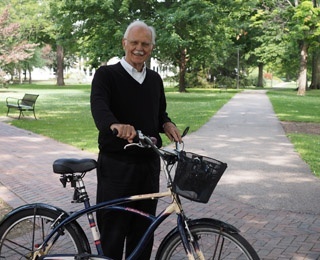 I remember talking to Hugh McCorkle, a Kendal at Oberlin resident, about bicycling one day. He said “Don’t forget: left on limbs, right on rims.” That phrase stuck with me – a great way to remember that bicyclists ride with traffic, while pedestrians walk against it. And bicycle riders should always follow the same traffic laws as motorized vehicles. Stop at red lights and stop signs, and don’t pull your bicycle alongside a vehicle stopped at a traffic light. Use hand signals when turning, and be cautious. Look to be sure that all motorists at an intersection see you before turning. A lot of leisure cyclists enjoy riding on trails in parks and nature preserves. There is less traffic and generally more nature to enjoy along the way. The popular Rail Trails are paved over former railways, and traverse the country. My favorite spots to bicycle in northeast Ohio are the Towpath Trail that runs through the Cuyahoga Valley National Park and the all-purpose trails in the metro parks of Cuyahoga, Lorain and Summit counties. Most of these trails are for “shared use,” for both walking and cycling. Here are some tips for safety on such trails from the Ohio & Erie Canalway. Be bright (clothing) and stay to the right. Give audible warning before passing. Use a bell or call out a notice. Keep one ear clear. If you like to listen to music on the trail, use your earbuds in only one ear. Take breaks to the side of the trail. Don’t stop in the middle and expect others to ride or walk around you. On trails where you are likely to see families riding, I would also suggest using extra caution when passing groups with younger children. The same advice applies with pedestrians walking a dog on leash. Be sure to announce your intent to pass so they can be sure their pet is under control as you ride by. I know we mentioned this before, but it’s worth repeating: wear a helmet. They can help prevent serious head injuries if you fall or are involved in an accident. According to the CDC, any bicyclist who does not wear a bicycle helmet is at increased risk of head injury. Wear brightly colored or reflective clothing. If you ride at dusk or at night, make sure your bicycle has lights in both front and back so you can be seen easily. This is especially important if you are riding on the road with motorized traffic. I always carry my cell phone with me when I ride, especially if I am riding on my own. In addition to being able to call someone in case of an emergency, I use an app called “Map My Ride.” It tracks the distance, speed and maps out the path I’ve traveled. Some parks may have staff or volunteers that ride the bicycle paths to assure safety or provide basic first aid for visitors. But if you have a backpack, basket or bag for your bike, it might not be a bad idea to carry a small first aid kit for scrapes and scratches. Bicycling can be a fun activity for families. If you have grandchildren, I bet they’d love to join you for a bike ride on a trail in your local park. Pack some snacks and plan to stop along the way to explore the area around you. It’s a great way to spend a summer day! Please share some of your favorite places to ride your bicycle in the comments below.